ON TOP of the two-story high Shannons ‘Super Rig’ promotional truck, overlooking Victoria Park adjacent to what is usually turns 12 and 13 of the Adelaide 500 circuit, a kid aged perhaps six or seven years old was grinning like a lunatic. Holding his fingers in his years he laughed the laugh that you can only get when something surprises you with it’s noise or its speed or a combination of the two – like when the RAAF surprise everyone with an FA-18 flyover or a band bursts into song when you least expect it. 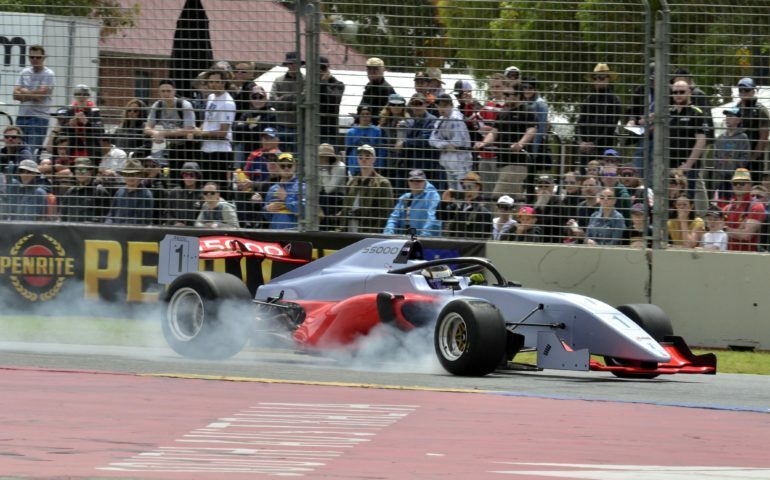 On the track, on a warm and muggy Saturday afternoon, was the brand-new S5000 racer being driven in a somewhat exuberant fashion by triple Formula 3 champion Tim Macrow. It was perhaps the most telling example that if any open wheel category has a chance of succeeding in a meaningful fashion, it’s this. As Macrow turned the car off Wakefield street and into a tight, first gear hairpin that brings the shortened Adelaide Motorsport Festival Sprint Circuit back onto the permanent section within Victoria Park, the car transitioned into oversteer. With old tyres and a heavy right-foot, it didn’t take long for Macrow to massage the rear of the car into a graceful, 50-metre long bout of power oversteer before plucking the next gear. It was impossible not to chuckle. Macrow was having fun on 80-lap old tyres and a track covered in oil. The punters loved it. The kid loved it. Next to him, his dad just grinned, probably thinking of how much it reminded him of his past. If S5000 is to work it will be because it will be a category that people will actually want to go and watch because the cars are exciting. The public demonstrations last week in Newcastle and this week in Adelaide are something of a proof of concept. But if anything is to go by it’s going to draw people in droves. With straight-through exhausts and a driver willing to extend the car to what seem to be rather high limits, the S5000 more than held its own despite sharing a track with a Leyton House March driven by a proper F1 driver, a Footwork Arrows steered by a Supercars driver, Two Larousse Lola’s and a host of other classic F1 machinery. The S5000 was physically more imposing, louder and every bit as quick as the well-driven F1 cars – cars that had Ivan Capelli and Josh Kean behind the wheel – despite giving away 300kg for about the same power which on the tight 1.4km circuit had the big Aussie beast at a disadvantage. It didn’t look it though. On Sunday morning, overnight rain having cleaned the circuit and knocking ten degrees out of the ambient temperature, Macrow put new rubber on, fiddled with a little rear wing adjustment and tightened his harness to have a real go. Our vantage point this time was on the fence, just beyond the almost-flat kind behind the Supercars pits. Looking straight across the track was pit entry; to our left the hairpin and right a vantage through the fencing and towards the left-hander that swings the cars back into parklands and then the very quick right hander that in most things you’re turning and braking through all at the same time. Instantly the 5000 looked more serious than it did on Saturday when that Kid and I chuckled at Macrow’s power-oversteer antics. It had that look of a car on attack that you get in a qualifying session. It looked good. Tim was flat – and clearly working very, very hard to be flat – through the kink before braking for the hairpin, the left-front locking in protest with a puff of white smoke as the speed reduced and the car rotated to the apex. Mid corner came the throttle, hesitant at first, and then more aggressively as the car completed its rotation and straightened up with a glorious power slide to the exit kerb. From there it was all V8 noise, the crack of a gearshift, more V8 noise, another shift and so on as the car disappeared towards the Senna Chicane. The result was a quick lap of 43.41s, only eight-tenths slower than what would ultimately be the new lap record, Ivan Capelli’s excellent 42.57s. The punters around me loved Capelli, sure, but they also loved the S5000. You’ll probably call me biased. Mates with the driver. Used to work as a freelancer for the category manager. An Open Wheel tragic crying out for anything resembling a top category in this part of the world. And in those assumptions you would be correct. But what we saw on the weekend made the race fan within me grin like a lunatic, vested interests or not. Sharing a race track with 1980s and 90’s era Formula One cars, things I like more than Beer, the S5000 more than held its own both in performance, visual and aural appeal. No one cared about the Halo. People just got all jazzed up about a cool car that sounded epic being driven hard. As it should be. Which brings me back to that kid on top of the Super Rig earlier that weekend. When I was young, going to the Adelaide Grand Prix in 1991 or ’92 was what dragged me into being a Formula 1 fan. The visceral nature of the cars, the noise, the performance and the speed was what dragged me in. At that age I loved Gerhard Berger and Nigel Mansell but most of all I loved the cars. I drew them, I bought models of them and I wanted to work with them. Supercars – especially on a standing start – have the same appeal and I challenge anyone to not be impressed when standing trackside during the start of the Adelaide 500 or Bathurst. Your heart shakes. With the greatest of respect to other categories, few others on the scene at the moment have the kind of appeal that grabs you by the curly bits and drags you in. Some have great cars, some have great racing and some have both. But few have that x-factor that, like Formula One in the 1990s, grabbed a kid by the neck and said ‘Watch me!’. When the revised S5000 concept was launched earlier this year some punters rubbished the Halo and criticized the ‘generic open wheel’ design that removed the retro nods of the two rather unique prototypes. But none of that matters. This is not a car you should look at in renders or images. It is a car that needs to be seen live. Having now seen it driven – with the greatest respect to Greg Murphy, John Bowe, Garth Tander and the Newcastle street circuit – as it should be – flat out – I think S5000 may finally be the answer to the question we’ve all been asking. Can Australia have a top-level open wheel category that has a real chance of drawing in fans, that can be something inspirational rather than just another category filling space? I think perhaps it can.